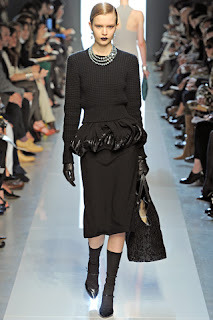 Just as we thought everything had gone all Gothtastic for Autumn/Winter, along comes the fabulously restrained and elegant Mr Tomas Maier at Bottega Veneta to allay our dark fears and put some much needed sense and sophistication into the mix. Bottega’s palette ranged from subtle navy, black,wine, taupe and soft aubergine to dusky ’30s pink and deep purple with flashes of multi colour patten all on a bed of divine sleek proportions that were just right and just so for the grown up sophisticate with a cutting edge. 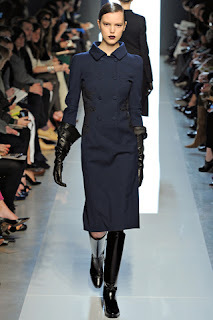 There were elements of a modernist Wallis Simpson about this collection with its slick subtlety, skirt suit tailoring, sleek on the knee feminine dresses, peplums and narrow rounded ’30s style shoulders. Yet, there was sensuality. Deep V plunges, corset effect on patterned dresses, long leather gauntlets, feather and beaded detailing and muted frills and swathes ensured that every tasteful woman warming up for her ‘best dressed’ medal will be lining up to be muse Veneta. 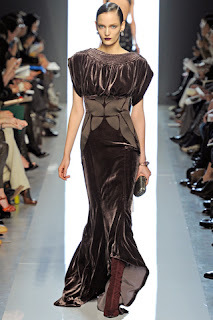 Maier finished on expensive, deep silk flowing velvets with frills at the hip, deep V necklines, leather corset style or butterfly detailing, often cut low in the back. Maier’s fashion diplomacy pulled off the perfect balance in this show. Sophistication and sexiness, opulent detailing versus restraint, a varied colour pattern on a autumnal theme and just enough hard edge tinges to hold everything together and to keep it multo interesting. Maier could show others more long in the tooth exactly how to modernise their House vision. But Bottega would be all the poorer for losing him. Catwalk images courtesy of www.style.com For reviews and images from Milan Fashion Week please click on the link.